XM603 retired to Woodford and was lovingly looked after by the Avro Heritage Trust at BAE Systems' Woodford plant (with what appeared to have been on/off support from BAE themselves - mostly decidedly 'off'!). Three of her engines were in running condition, but the fourth was giving them problems for some time. The death of their engine specialist Dougie Godfrey dealt a blow to the plans to replace the engine but they overcame this and installed another 301 engine. They hoped to run all four engines up soon after, with a possibility of taxiing the aircraft at the Woodford airshow in 2000 but sadly never made it and after then the aircraft became subject to restrictions on working on it with engine runs forbidden. The dreaded health and safety was quoted as the reason, with BAE Systems being accused of wanting the airframe quietly scrapped. In the years after that the aircraft's future had looked very bleak and she was thought likely to be scrapped at any point. However, all was not negative - she played a vital part in keeping XH558 airborne, with various tests being carried out on her airframe to ascertain what useful life XH558 had without making destructive changes to 558. She also donated a couple of engines to XM655, which continues to taxi at Wellesbourne. 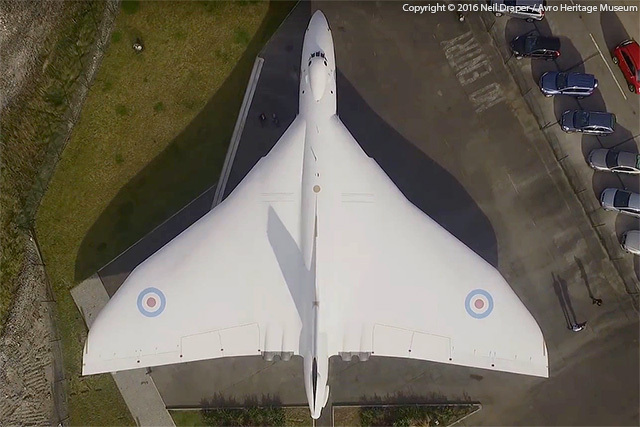 With BAE's departure from Woodford, however, the future began to look brighter - BAE donated a parcel of land including the former fire station to the Avro Heritage Trust, and they converted the building into a modern museum and commenced a restoration of XM603. On 25th October 2016 she was unveiled and - as you can see - looks glorious! We can only hope her future includes some undercover accommodation.